Wow, it’s been a while hasn’t it? Well here’s a really good recipe to help us get back into the swing of things! I had planned on creating lots of new citrus recipes this past season, and I did get a few put together, but this last one comes straight from a cookbook. I did actually try making my own version of an orange yogurt bread but it wasn’t nearly as good as the one I’m about to share with you. The Taste of Home Baking Book is one of the many cookbooks I picked up during my ‘welcome back to the states’ shopping sprees. I like this book because it is designed to be used. It’s hardcover and ring-bound so the cookbook will lie open flat on the counter making it easy to read while preparing a recipe. The pages are also removable in case you don’t want to have the entire book out. But what’s really great about this book is that it’s filled with photos and good general information about baking in addition to tons of wonderful recipes. 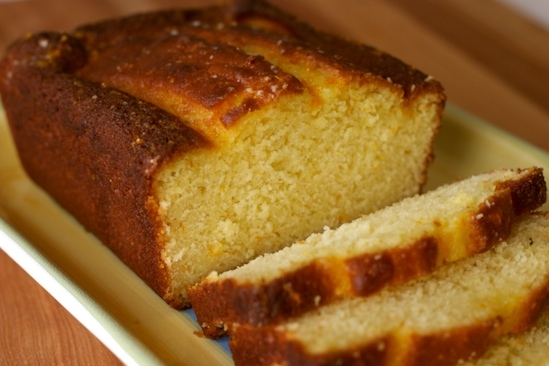 This Orange Yogurt Bread is the first recipe I tried from the book but I’ve already bookmarked several others. I hope you enjoy it as much as we did! 2. In a large mixing bowl, cream butter and sugar until light and fluffy. Add eggs, one at a time, beating well after each addition. Add yogurt, orange juice and peel. Combine the flour, baking powder, baking soda and salt; add to creamed mixture and mix well. 3. Pour into a greased 9-in. x 5-in. x 3-in. loaf pan. Bake at 350° for 55-65 minutes or until a toothpick inserted near the center comes out clean (cover loosely with foil if top browns too quickly). Cool for 10 minutes before removing from pan to wire rack to cool completely. 4. For glaze, combine confectioners’ sugar and enough orange juice to achieve desired consistency. Drizzle over cooled bread. Recipe notes: I followed this recipe closely. The only change I made was to grate an extra teaspoon of orange zest and add it to the glaze. I also poked holes in the top of the bread with a toothpick before spreading it with glaze. Make sure to check the bread early because the top did brown quickly. The bread freezes very well. I froze half the loaf by wrapping it in foil and then sealing it in a plastic freezer bag. It was still very moist and flavorful after defrosting. Your photos are always so beautiful, and this bread sounds delicious! Keep these great posts coming. Nicole, your blog was one of the ones I found and loved when I first started actually blogging. I have missed your posts and was so thrilled to see one come through my reader tonight. Your cake looks lovely and I am sure tastes delicious! My aunt makes a wonderful fruit and yogurt loaf that is infinitely variable by switching the flavour of fruit and yogurt. It sounds as though this loaf could also be adapted in a similar way. Looks great! I've actually thought about buying that book. I have a few cookbooks that are ring bound, and I love them because if I'm making more than one recipe from the book, I don't have to keep flipping back and forth - I can just take the pages out! !This bread sounds amazing! Ruby: What I love about this bread is the buttery flavor. The taste reminds me of pound cake but isn't quite as heavy. You could easily turn this into a lemon bread if you want!Whitney: Thanks! I'll do my best ;-)Gretchen Noelle: Thanks! I think you'll be hearing from me much more often now!Claudia: Cool! Let me know if you decide to make it later :-)Brilynn: Yes, this could easily be adapted but I think I think I'd prefer to stick with citrus fruit of some kind. Lemon, lime or a combination would be really yummy!Deborah: I think the only other ring bound book I own is the Better Homes and Garden Cookbook which is actually the first cookbook I ever owned. Oh, I make one a lot like this, but with strawberry yogurt. 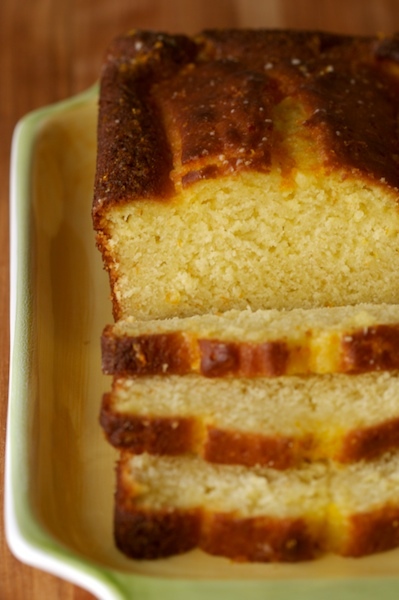 It IS like a poundcake, and it even gets better as it ages a bit. I love the idea of doing a citrus one, though, and yours looks fabulous! I also bought that exact book for my niece for Christmas, since she's a budding baker, and it seemed like a good place for her to start. I should have picked one up for myself at the same time, lol. Hi sweetie! What a delicious recipe, Nic. It looks so tender... Yum! Maybe you could turn the glaze into an icing and use it to make lines and whatnot on top of the loaf. Oh this looks sooooo moist and zippy. Must try it soon!!! this looks so delicious! i've never made yogurt breads before, but i think this one is calling my name. Elle: Mmmm...strawberry sounds good! Do you add fresh strawberries to the batter, too? Patricia: Yes, it was nice and tender. Thanks! Anali: I want to try it again soon with lemon instead of orange. The citrus and yogurt are a great combo! Mandy: Ooooh, grand marnier would be great! Ok, that's just wrong!! Looks delicious! Glad to see you back! This looks divine and I'm most definitely making it soon! This looks so moist and delicious! This looks fabulous - and it's easy to make with things that are already in my pantry. I'll have to give it a try! I just made your pumpkin, walnut & cranberry muffins, they are delish!!! I will try this bread soon. This is my first time on your website. I like! I throught the bread looked delicious so i made it, im not sure if it was my dodgy conversions to metric or if i cooked it wrong, but the bottom part didnt rise or cook fully!! such a pity cos the top was delicious!! Hi,This looks like a great recipe. To significantly lower the fat and calories and slightly increase the fiber, you can substitute applesauce for the butter and reduce the sugar by 1/4 cup without a noticeable difference. Try substituting 1 cup of whole wheat flour for 1 cup of white flour for increased fiber. The bread is now much more nutrititious and tastes great! You can also omit the salt as there are other levening agents and you won't even notice the difference. That is so pretty, I bet it tastes as good as it looks too! hi!! first time here! !this mango yogurt bread looks soooo moist....really delicious...will definitely give it a try!!! This recipe is so good! Next time I make it, I will soak all sides of the bread with the glaze. We had it like a shortcake with strawberries and whipped cream. It is also great toasted with butter for breakfast. I think I'm going to use this recipe for the county fair! Thank you so much! Good site and splendid descriptions however much as I would love to try out your recipes, esp. this orange yogjurt bread the measurements are all in US imperial. do you plan future recipes in metric or a combination ? mmm yum that just looks so good. rather be eating that tan sleepng with my husband!! Very tasty!! Made it a little healthier by substituting 1/3 cup butter with 1/2 cup applesauce and 1 cup AP flour with white whole wheat flour! I have to say that I just came across this recipe and LOVE it! I've made it twice and changed up the recipe both times (I added cranberries and used wheat flour) and it is delicious every time. I love your blog! free google+ invites on my site.